The FANMATE 2 product is included with the many of Zalman's CPU coolers and the feedback has been so good that we are now offering it separately for customers who wish to use it with other fans. The FANMATE 2 is connected in-line with an existing fan and allows infinite control over the speed at which the fan runs. Where a fan is making a lot of noise due to excessive airflow, this can be reduced in a controlled manner, until such point as the noise becomes minimal and the airflow still adequate. The silencing effect of reducing the speed of a fan even by a small amount can be very surprising! The FANMATE 2 has a small rotary knob which can be turned in either direction, to raise or lower the fan speed. Once you are happy with the noise/airflow setting, just leave the knob set in its position and your installation is finished. The best approach is to start with the FANMATE 2 at its minimum speed setting ("silent mode") and then increase the speed if more airflow is required. Rather than using a simple rheostat (variable resistor) arrangement, the FANMATE 2 uses a high quality variable voltage regulator circuit which will not wear out or run excessively hot. Full instructions are supplied, and installation is very easy as can be seen in the diagram below. The product is intended to be used primarily with case fans, and you may be surprised how reducing the speed of a case fan (even slightly) can have a very large effect on noise output, with only a minimal effect on airflow. Of course the best approach is to use fans which are quiet to begin with, but if this is not possible, the FANMATE 2 will provide a very satisfactory alternative in your quest to reduce noise. Although using the FANMATE 2 in conjunction with the fan on a CPU cooler is certainly possible, you would need to be careful to ensure that the processor does not get too hot due to inadequate airflow. If you have a CPU heatsink which is thermally inefficient in its design, then its manufacturer may have compensated for this shortcoming by providing it with a high-flow high-noise fan, usually because fast fans are cheaper than good heatsink designs! Using the FANMATE 2 in this scenario is not a good idea, and if budget allows, we would always recommend replacing the whole CPU cooler with one of the coolers we sell. This will guarantee safe cooling with the minimum possible noise level. Please note that you must not use the FANMATE 2 in conjunction with any 12 volt fan having a power consumption in excess of 6 watts, or 0.5 amps. 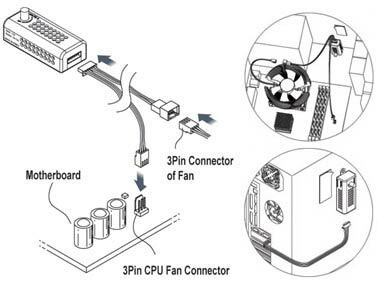 Damage to the fan and/or Fan Mate and/or PC system could otherwise occur. Virtually all but the very fastest/most extreme airflow fans consume under 6 watts and are therefore fine, but please check your fan specification before using the Fan Mate if in any doubt. Finally, when using the FANMATE 2 at its minimum speed setting, you must ensure that the fan has a minimum startup voltage specification of not more than 5 volts. Otherwise, the Fan Mate will not give a high enough voltage to get the fan started from rest. Before finalising your installation, please test that all FANMATE 2-connected fans successfully start when you first power on the system. If you are using the FANMATE 2 with any of our Ultra-Quiet fans, you do not need to worry about this point because all our Ultra-Quiet fans are guaranteed to start at 5 volts. Bought this one couple of years ago. Still working like a new. Very good quality and service from QuietPC. Works great, only a slight gripe. Does exactly what it says on the tin, my only problem with it is that even set to maximum the fan isn't at full speed. My Noctua 80mm has a max speed of 1800rpm which it was producing more or less dead on before I fitted this, now it maxes out at 1500rpm. It would be nice to be able to run it at full speed should I ever need to. Always feels like there's not enough range to operate. You never know what voltage fan is using right now. Other then that it's a nice gizmo. 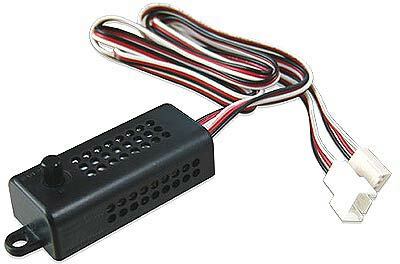 Installed 4 of these in my small HTPC case. - cables are too long rather than too short (cable tied). - very simple to set up and use. - you have no idea what voltage the fan is using. - think the rotary dial should be exchanged for a 5,7,9 or 11 volt switch. All in all very useful for getting fans to spin slower to make them much more quiet. A doddle to install. For less than £4 you get complete control of your CPU fan speed. The only tiny issue was that it comes with *miles* of cable to let you position the controller outside your case (it even has a sticky pad to allow easy fixing). An elastic band tidied up the cable and it's great. I expected nothing less from THE BEST CUSTOMER SUPPORT COMPANY IN THE WORLD! If Andy at Quiet PC recommends something that's good enough for me. Simple, cheap, effective. Not pretty but you're not going to see much of it so that doesn't matter, does the job you need.